Welcome to the Oneness Online Store! Here, you will be able to order a beautiful range of books and audio products that bring the timeless wisdom of Oneness to life. 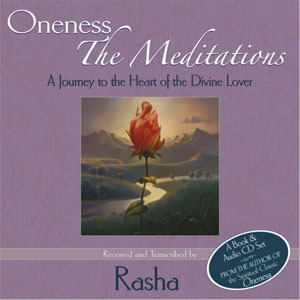 Transcribed, designed and created by Rasha, and published by Earthstar Press, the Divine teachings of Oneness offer you a bold new perspective on the essence of radical global change and a compass for the life-altering journey of spiritual transformation. A Special Discount for the New Year !! Take an ADDITIONAL 10% off !!! To help you ring in the New Year with a smile, we're offering you an additional 10% off our already discounted prices on everything in the Oneness Online Store! Be sure to enter the Promo Code - "NEW YEAR" - at checkout time. We're thrilled to present Oneness-The Meditations !!! This beautiful companion volume to the audio CD, "The Meditations of Oneness," features powerful, poetic passages from recent Oneness transmissions. Now, in this long-awaited book format, you can slowly savor the words of Oneness and surrender with ease into the embrace of Divine Love. To help celebrate, we're offering some wonderful Special Discounts, for a limited time only. We hope you enjoy perusing our books and CDs and come back to visit us often, to see what's new! Copyright © 2018 by Rasha. All rights reserved.